Were you able to attend our last Webinar, Best Practice Checklist for Hosting an Effective Webinar, with Chris Bechtel, Managing Partner at Growth Engine Labs? During the Webinar, we discussed how to make your next webinar great by using our Live Webinar Checklist. Or click here to download the slides. Want a copy of the checklist you can refer to when putting together your next webinar? Check out our previous blog post to prepare for your next Webinar. Were you able to attend our last Webinar, Growth Hacking with Interactive Content, with Randy Rayess, Cofounder of OutGrow.co? During the Webinar, we discussed how to apply growth hacking initiatives featuring interactive content such as dynamic surveys, calculators and more. We also encourage you to sign up for our next webinar, “The Best Practice Checklist for Hosting an Effective Webinar,” on May 31st at 11:00 am PT; featuring Ken Molay, founder and president of Webinar Success. Click here to register. Part 3 of our free webinar series, “Accelerating Your Business Growth” entitled “Smart Financial Management”. This series is presented by AnyMeeting, SCORE, a non-profit association dedicated to helping small businesses launch and grow, and Comcast Business, a provider of advanced communication solutions to millions of small business. In this series, we’ve presented webinars featuring business leaders and SCORE mentors speaking on topics important to small business. This webinar features SCORE mentor John Harman who discusses tips on working with financial statements, financial ratios, cash flow forecasts, and trusted advisors to drive and fund your business’s growth. John is Managing Director of Adulant Consulting Services, which advises small and mid-sized businesses on strategies for growth and operational excellence, and a SCORE mentor. John’s prior experience includes senior executive roles at Eastman Kodak, the Gartner Group and Pitney Bowes in sales, marketing, quality management, strategic planning, mergers and acquisitions, and new market development. Before entering the business world, John was an adjunct professor of history at the University of Rochester and worked in the Office of Research Administration as Assistant Director. John is currently an adjunct professor in the Dolan School of Business at Fairfield University in Connecticut. Get insights and listen to actionable advice as John engages the audience in live Q&A. Whether you are just starting your business, looking to accelerate your growth or simply want to gain an edge to get your business to the next level, you won’t want to miss out. Watch the full webinar recording here. Want to view and download the presentation from the webinar complete with John’s resources? Get it from Slideshare. 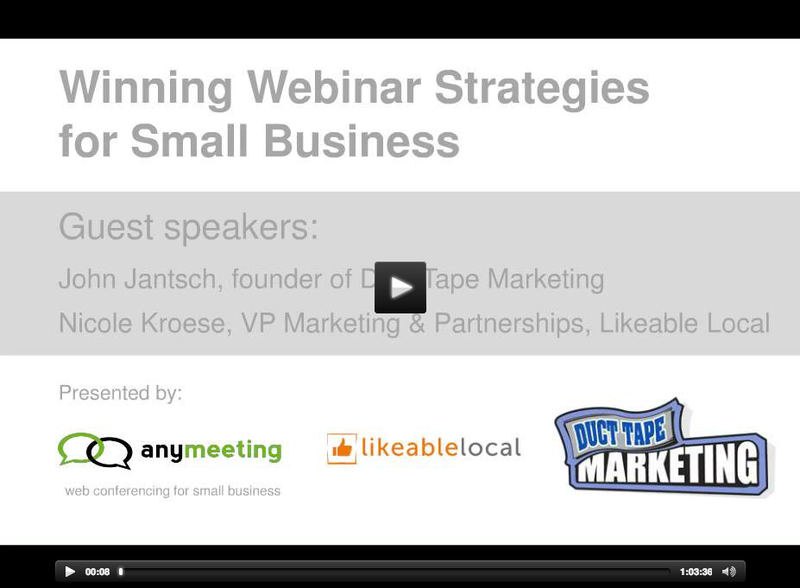 Be sure to check out the other webinars from this series and stay tuned for our next webinar coming soon! Part 2 of our free webinar series, “Accelerating Your Business Growth” entitled “Strategies to Boost Your Sales”, presented by AnyMeeting together with Comcast Business and SCORE, featured speaker Carleton Smith, the former Vice President of Worldwide Sales and Marketing for Harris Corporation, a Fortune 500 company with worldwide operations. During his forty year business career, Carleton managed turnarounds, acquisitions and mergers, and worldwide sales and marketing for companies and divisions in difficult markets with demanding customers and tough competitors. Carleton has been a volunteer business counselor with SCORE in Austin since 2006. Using a Customer Relationship Management (CRM) system to manage and retain customers. Get insights and listen to actionable advice as Carleton engages the audience in live Q&A. Want to view and download the presentation from the webinar complete with Carleton’s resources? Get it from Slideshare. 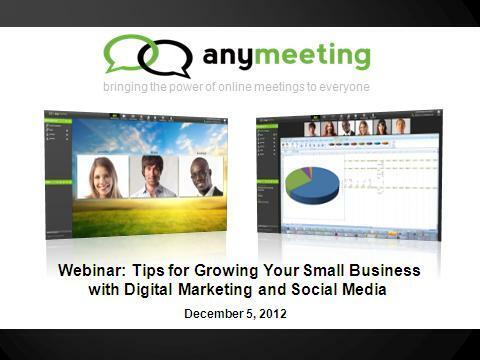 Be sure to check out the other webinars from this series and sign up for the latest webinar today! 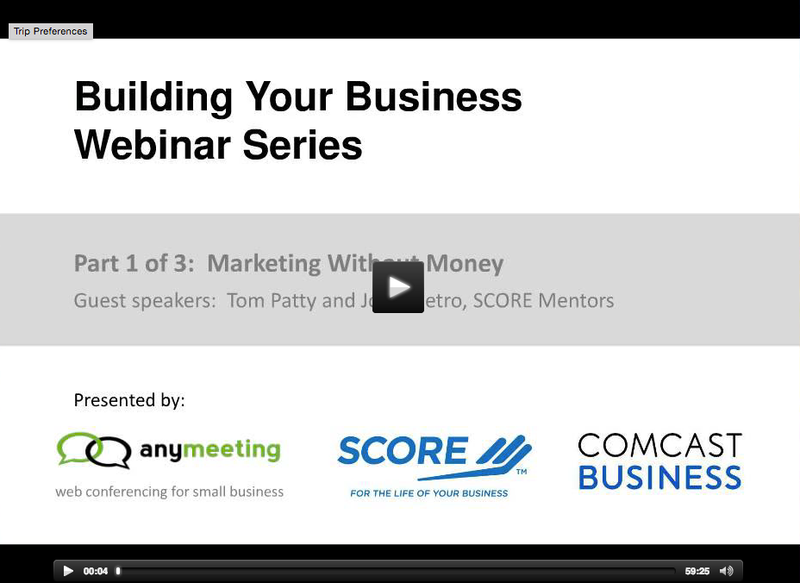 ICYMI: The first of our free 3-part, “Building Your Business Webinar Series” presented by AnyMeeting, Comcast Business and SCORE, “Marketing Without Money” is available as a recorded webinar. Hear from SCORE mentors Tom Patty and John Pietro to find out how you can use million-dollar marketing ideas on a zero-dollar budget. Learn the strategies of big budget marketing to grow your small business, how to get more customers and increase your response rate without spending a dime. Tom spent over 21 years in the advertising business and retired as President of Chiat/Day, one of the most creative ad agencies in the country. John has over 40 years’ experience in marketing, advertising and promotions. He helped create the famous “Where’s the Beef” campaign for Wendy’s. Join us for a free 3-part Building Your Business Webinar Series, presented by AnyMeeting, Comcast Business and SCORE, a non-profit association supported by the U.S. Small Business Administration with over 11,000 volunteers dedicated to helping small businesses launch and grow. Check out the sessions below and register today. Join SCORE mentors Tom Patty and John Pietro to find out how you can use million-dollar marketing ideas on a zero-dollar budget. Learn the strategies of big budget marketing to grow your small business, how to get more customers and increase your response rate without spending a dime. A business plan is an essential road map for business success, but few small businesses ever complete a plan due to over-complicated approaches that entail too much theory, writing and detail. This webinar will give you pragmatic, straightforward tools for setting goals, developing action plans for achieving them, measuring how you are doing on an ongoing basis and adjusting accordingly. David Albright is an active SCORE mentor with extensive experience in the consumer products industry including being President of Pepperidge Farm, Inc., Godiva Chocolatier Worldwide and Glacial Confections, a start-up venture. He currently consults with venture capital firms on the food and confectionery industries. SCORE is here for the life of your business. With free mentoring, training and resources for entrepreneurs and small business owners,SCORE is committed to helping you succeed – whatever your business goal! With more than 10 million people served by SCORE since its inception in 1964, SCORE works with you to provide you with customized, unbiased assistance – no matter what business stage you are at. Join this webinar to learn about the ways that SCORE can help you today. Bridget Weston Pollack is the Vice President of Marketing & Communications at the SCORE Association. In this role, Bridget is responsible for all branding, marketing, PR, and communication efforts. She focuses on implementing marketing plans and strategies for the organization to facilitate the growth of SCORE’s mentoring and trainings services. We’d also like to thank the more than 400 registrants and attendees who participated with great questions and comments. Chris’s webinar provided a fast-paced, interactive webinar that introduced smart and effective strategies for growing a small business through digital marketing and social media. If you were not able to attend live and would like to view the recording, just click: Recorded Webinar to Grow your Small Business. How valuable would it be to learn about the latest, smartest and most effective strategies for growing your small business through digital marketing and social media? Small businesses have more ways to communicate and engage with customers than ever before. Everything including mobile, Facebook and blogging is “fair game” for businesses to use to reach their customers – and customers can talk back! Join us Wednesday, December 5th at 11 am PT for the next free webinar of our “Small Business Toolkit webinar series, and get answers to these and many other problematic and promising issues in small business marketing. Our own Chris Bechtel, Director of Marketing for AnyMeeting, will lead a fast-paced, interactive webinar that will address a wide range of critical small business marketing issues and help bring your strategy up-to-date. Chris is a 15 year digital marketing veteran, consultant and growth hacker. Only 200 spots are available – so sign up today. Make sure you log into the webinar early – attendance is on a first-come, first-served basis. A recording of the webinar will also be made available for all those who register.